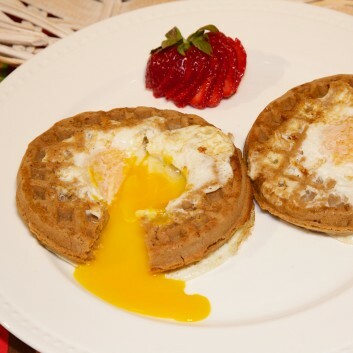 Why choose between two breakfast favorites—waffles and eggs—when you can have both? This dish is fast enough to whip up for the kiddos on a weekday morning but decadent enough to enjoy on for lazy Sunday brunch. Dig in! Lightly toast the waffle and cut a hole in the center.